This article was originally posted when Superstorm Sandy was ready to make landfall in the Northeastern portion of the United States. Despite its age, this article is still very pertinent today because major weather events occur on a regular basis. I hope you find this article insightful. Many of you are probably aware that Hurricane/Superstorm Sandy made landfall in the Northeastern portion of the United States on Monday. Those of you who have followed news stories about Sandy don’t need me to tell you that Sandy was a historic storm in terms of size and strength (in terms of barometric pressure). The storm is particularly remarkable because it impacted some of the most, if not the most, densely populated areas of the United States, including New York City. I recalled a very interesting weather event that had a significant impact on American history while thinking about Hurricane/Superstorm Sandy on Sunday. I think it is worth mentioning this event in an article because I don’t think a lot of people have heard about this event, including most Americans, and it is an event that I think can be cited as evidence that God is in control of the weather and in control of the fate of nations. Before I discuss the weather event I would like to present a few verses. The following Bible verses in the table below indicate that God is sovereign over the weather. Since God is sovereign over the weather it is reasonable to think that no major weather event in history has occurred without God permitting it to take place. 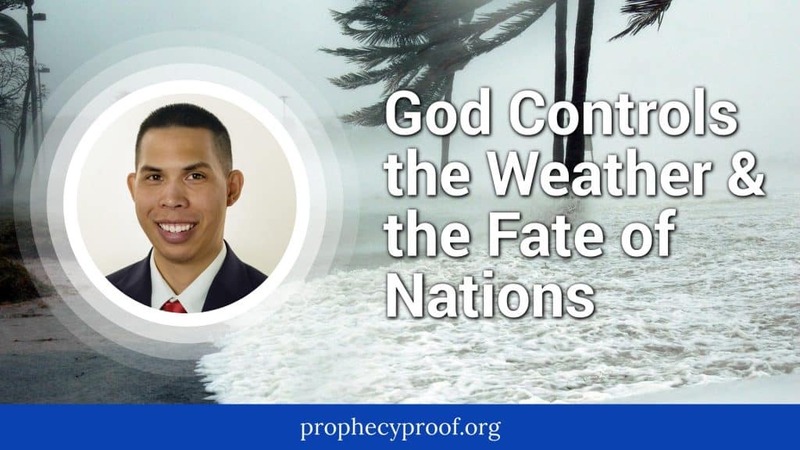 Given that the Lord is sovereign over the weather and sovereign over all nations, it is reasonable to think that major weather events which alter the course of nations are under the sovereignty of the Lord. America was at war with the British Empire in August 1814. The British sent approximately 4,000 troops to Washington D.C. to burn the city to the ground with the hopes that destroying the city would lead to America’s surrender. The British troops that moved into Washington D.C. managed to set fire to many of the key government and public buildings in the city, including the White House. The British troops remained in Washington D.C. to set more fires in the city when a thunderstorm suddenly formed nearby and traveled into the city. The rainfall from the thunderstorm was so intense that it extinguished a lot of the fires that the British set in the city. However, the biggest “surprise” for the British troops is that this thunderstorm unleashed at least one tornado that traveled to where they were positioned in the city. The tornado decimated the British troops’ position and inflicted large casualties on the British. The damage inflicted to the British was so severe that the surviving troops withdrew from the city, and they never returned to the city after that. Those who are interested in watching a video about the event can find a video about it at the following link The video speculates that the storm weather was part of a hurricane. just had to thank you.